Italian buyers can buy an Insight for as little as 14,900 euros. 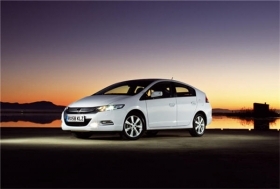 TURIN - Honda will price its new Insight gasoline-electric car at 19,900 euros in Italy. Italian buyers can buy the five-door hatchback for as little as 14,900 euros if they take advantage of the government's incentives schemes. With CO2 emissions 101 grams per kilometer, the Insight qualifies for a 3,500 euros incentive for hybrid vehicles that emit less than 120g/km. The incentive cuts the Insight's price to 16,400 euros. An additional 1,500 euros incentive is available to buyers who scrap a car registered before the end of 1999 at the same time as they buy an Insight. This reduces the price to just 14,900 euros. Honda will begin deliveries of the Insight to Italian buyers in mid March. The company aims to sell 30,000 Insights a year in Europe including 4,000 a year in Italy. The annual global sales target is 200,000, including 100,000 in North America and 60,000 in Japan. Honda introduced the first mass produced hybrid to Europe with the first-generation Insight in 1999. Global sales of Honda hybrid vehicles exceeded the 300,000 units cumulatively at the end of January 2009.